One of the greatest mistakes made by adopters is to embark on a project to ‘implement ITIL’, without fully understanding the challenges or setting measurable targets. For organizations adopting ITIL v3 as the foundation for service improvement, the full framework is unfamiliar territory and can appear overwhelming. This session examines the early stages of the ITSM journey - moving from a focus on technology, to a focus on service - with due consideration given to the IT organization’s cultural readiness to adopt ITIL processes at every stage. Using lessons learned from other adopters, this session advocates a steady progression through the phases of the ITSM journey, explains how adoption of ITIL can provide fast benefit capture management attention and set the stage for the next leg of the journey. By attending this session, delegates will understand how to benchmark their organization against others, identify where they are positioned, and develop their plans to move from chaos to value on the ITSM journey. Patrick Bolger joined Hornbill in 1998 and in 2010, Patrick was appointed Chief Evangelist. Patrick is dedicated to the communication of industry best practices, working closely with customers, industry associations and IT luminaries to identify trends and educate organizations on the opportunity associated with service excellence. Patrick helps ensure that Hornbill’s solutions adhere to industry best practice. 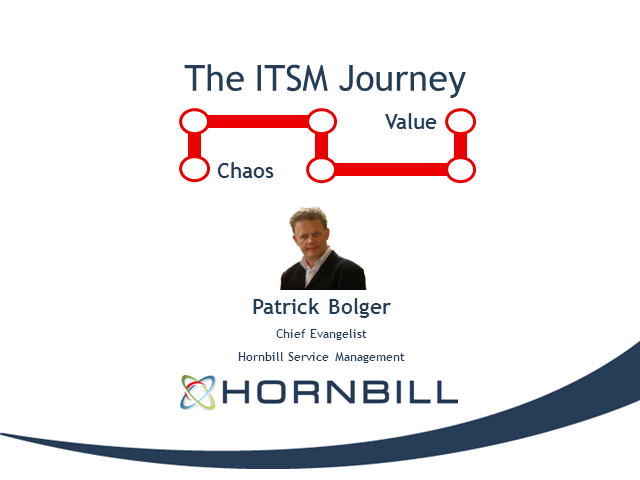 Patrick Bolger, Chief Evangelist, Hornbill Service Management. Presented by: Patrick Bolger, Chief Evangelist, Hornbill Service Management.